Here's another very easy donabe-steamed dish. Get your donabe steamer, "Mushi Nabe" ready and hope you enjoy this dish. 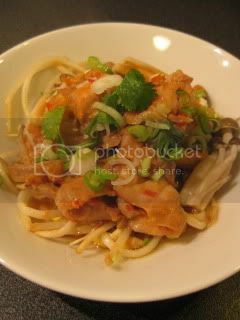 Using high-quality oyster sauce is very important, as it's the main flavor for the dish. I use high quality oyster sauce from Hiroshima, Japan. 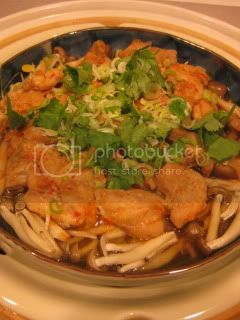 You can cook the chicken with leftover vegetable(s), so it doesn't have to be mushroom and bean sprouts! 1. In a bowl, combine the ingredients for the sauce. Add the chicken and mix well. Cover and refrigerate for 30-60 minutes. 2. Get Donabe Steamer, Mushi Nabe ready. 3. 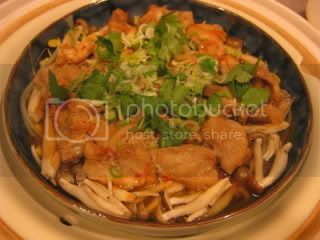 In a shallow ceramic bowl (with a flat bottom) which can fit Mushi Nabe, spread the soybean sprouts in the bottom. 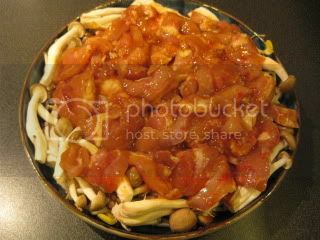 Add the shimeji mushrooms and spread over the soybean sprouts. On the top, arrange the chicken with the marinade. 4. Set the bowl in Mushi Nabe. Cover and steam for 10-12 minutes or until the chicken is cooked through over medium-high heat. Garnish with some thinly-sliced scallion and cilantro to serve. The dish is incredibly easy to make and the flavor is so complete and satisfying. It's great with freshly-made donabe rice, too.